Lemon is a popular natural way to lighten hair. Wanting to brighten up the hair is nothing new - women have been using home remedies to lighten hair for centuries. Whether or not blonde hair actually is more fun is open for debate, but millions of women prefer to test the theory themselves. Women living in hot climates used to have a great advantage over their more temperate-zoned sisters, because they had access to fresh lemons. Lemon juice is the most popular of home remedies to lighten hair and you'll be hard pressed to find a lightening formula that doesn't contain it. What lemon juice does is create photosensitivity (which is why you want to be careful when using it on your skin), so that when you apply lemon juice and then go out in the sun, your hair gets more exposure and is thus "bleached." It can look very natural, which is a great advantage, but it should be noted that this works best on those who already have hair on the lighter side, and it can be very drying. It is a cheap and effective tool, but one that you should apply with care. In addition to good conditioning - an olive oil treatment after bleaching will help your hair tremendously - if you are going to bleach with lemon juice, you should mix it with something less acidic. Olive Oil: Instead of treating your hair afterwards, you can try mixing the lemon juice with olive oil before going out in the sun. This will help to combat damage. Conditioner: You can achieve the same effect by mixing the lemon juice with your favorite conditioner. Chamomile Tea: This will make for a much stronger natural lightener. You will definitely want to do a deep conditioning treatment afterwards. Most of the above mixtures involve sitting in the sun for at least 20 minutes. It's long been known that the sun will naturally lighten all but the darkest hair. In many countries where fair skin and fair hair were popular, women's hats had an open top so that their hair could get the maximum amount of sunlight but their faces remained safely sheltered. You can still buy such sun hats today. It is recommended that you use conditioner and even sunscreen on your hair and scalp before exposing yourself to the sun this way. You will still receive the natural bleaching effect, but your hair and skin will be much healthier. Try chamomile tea for natural lightening. Sometimes it seems as though you can't boil water without hearing yet another benefit of tea. Green tea is good to drink, tea bags relieve eye puffiness, rosemary and sage can darken hair and chamomile tea is another age-old favorite of the home remedies to lighten hair. This method can be safer, but requires a lot more effort and patience. You must brew the tea and let it steep at least 20 minutes, although you will probably want to wait longer both to allow it to cool down and gain strength. Then prop a bowl under your head and use the tea as a rinse, reusing it three or four times and being sure to saturate the hair thoroughly. When you are done, let it sit in your hair for 20 minutes - you can go in the sun for a deeper lightening effect - and then rinse out and condition. 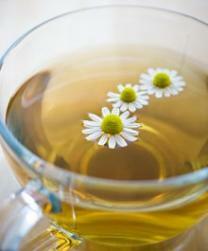 For an even more effective rinse, use chamomile flowers themselves, rather than tea bags. No matter what method you try, it's all better for your hair, skin, wallet, and the environment than opting for chemical hair highlights. The good news is that if you decide you look better with darker hair, it takes a lot less time and effort for the lightening effect to fade out!